I feel like I’m in a sewing rut right now. I keep starting projects and then abandoning them to start something else. I’ve got about five or six new clothing projects on the go that I can’t seem to make any headway with. I WANT to sew, but when I sit down to actually do it, I start thinking about what else I could be working on, never seeming to be satisfied with the project at hand. It’s totally frustrating! I decided I needed a quick project. Something I’ve made a bunch of times that I could start and finish quickly that would hopefully give me the satisfaction of completing something. I was definitely in need of a new shopping tote, so I whipped this up on Saturday night. After cutting out all the pieces, it took me less than an hour to sew this. 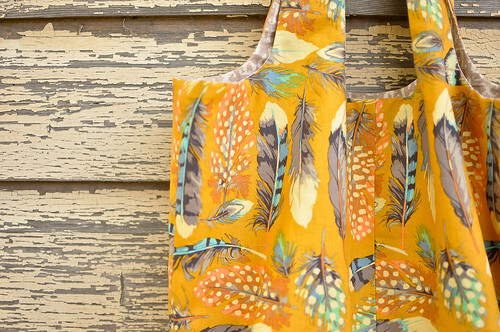 This feather fabric by Martha Negley just makes me so happy. I think it worked. Yesterday I finished up another Wiksten tank that I’ve had cut out for ages. Hopefully this week I’ll also finish up my Darling Ranges dress and get rolling on the rest of those projects. i definitely get into ruts like that. love both of these fabric choices!! totally know that scattered feeling. so glad you found a (very pretty!) way through it. That MN fabric is just perfect. Thanks to your tip, I bought a pile of it for some special (yet to be determined) projects. Ah, yes, I know these ruts well. Right now I’ve got two knitting projects, one crochet project, and one sewing project on the go. I feel like I need to go on a retreat to just finish it all. All of these regular work/life commitments are getting in the way! 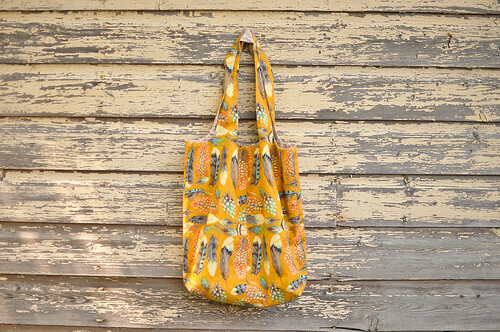 Love both prints on this bag! That seems like a great bag pattern–which one is it? 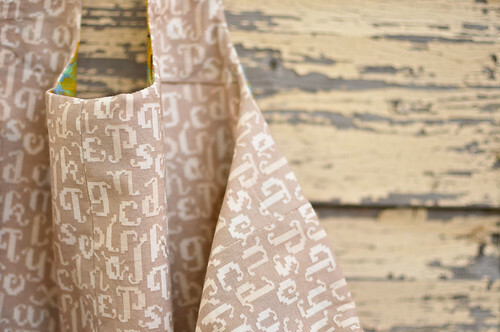 Any chance that you will one day share your shopping tote pattern with us? The shape and drape are just lovely (and that feather print is gorgeous!). The pictures of Anna Maria’s booth from quilt market have me drooling over feathers these days.